The Drug Speller offers a comprehensive alphabetical listing of all drugs prescription over the counter brand names and generic names. A MUST for your reference library! “I definitely recommend ‘Drug Speller’ to any institution, medical transcriptionist, or anyone in the medical field. The accurate spelling of trademark brands versus generic names is done at an expertise level and according to AAMT (American Association of Medical Transcriptionists) guidelines. over the counter, brand names and generic names. Stenographers! 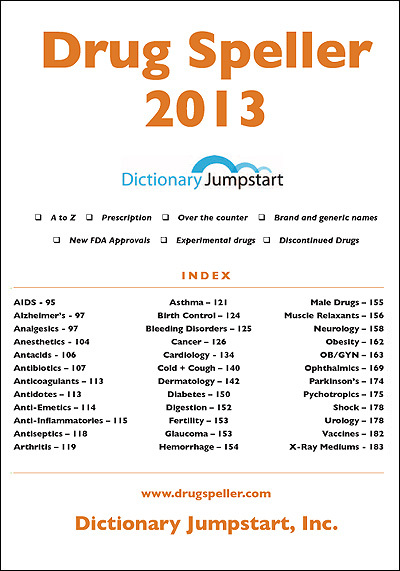 Add all of the drugs from the Drug Speller to your dictionary and earn PDCs with Dictionary Jumpstart’s companion Module! © Dictionary Jumpstart. All Rights Reserved.